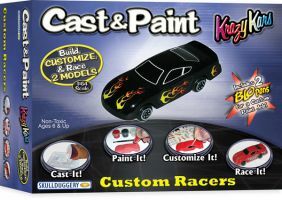 Gentlemen, start your engines - get ready to race with our Krazy Kars custom racers kits! Make and decorate two custom NASCAR-style, matchbox sized stock cars, then race them on all your matchbox-sized tracks. With four kits to choose from, you can get your favorite racer - or get them all and set up your own Sprint Cup race.